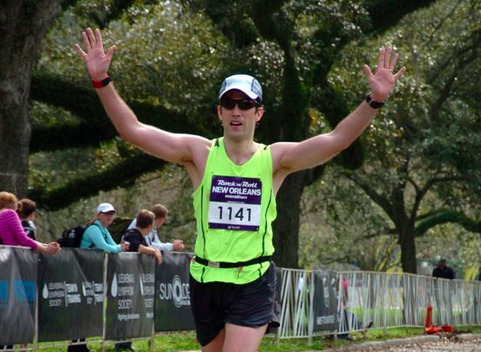 The 2013 Rock ‘n Roll New Orleans (NOLA) Marathon was my 13th marathon overall and first since being diagnosed with a femoral shaft stress fracture in late August 2012. 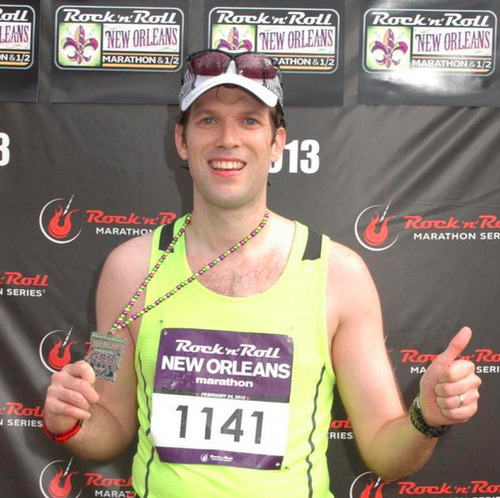 My current marathon personal best of 3:12:28 came at the 2012 Rock ‘n Roll NOLA Marathon in ideal weather conditions. After having a great month of January, my training had been very inconsistent in February leading up to the race, primarily due to my mission trip to Honduras and subsequent illness. I had also been dealing with IT band issues since returning from Honduras, which persisted until race day. All of this left me fairly unsure of my level of fitness for this marathon. The forecast leading up to the race also looked fairly dicey. The temperatures at the beginning of the race ended up being in the high 50s with full sun and very high humidity. For the second half of the race the humidity burned off slightly but we were left with temperatures in the mid 60s, with full sun, no shade, and strong winds by Lake Pontchartrain. With all of the uncertainty regarding my fitness level and the weather conditions, I decided to go with a fairly conservative strategy for this race. In last year’s race I finally completed my quest for 3:15 and since that time have been very public about my goal to qualify for Boston. To do this would require a marathon time of 3:10 or better which translates to a 7:14 pace per mile. Even though I felt that running a BQ time in this race was a longshot I decided to try and keep that pace within shouting distance in case I ended up feeling great for the second half of the race. My strategy was to start with a pace in the 7:20s and then slowly increase it through the remainder of the first half. At the halfway point I planned to take inventory of how I felt and make a decision of how hard I wanted to push it. When the gun sounded I had that typical adrenaline surge, but still kept my pace under control with a first mile split of 7:22. 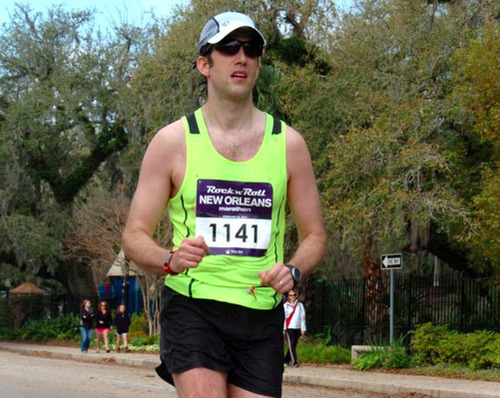 After reaching the beautiful, tree lined, St. Charles Ave. at the beginning of mile 2, the adrenaline began to wear off and I was left feeling pretty uncomfortable, and having a hard time finding a good running rhythm. I’m confident this was mostly due to the high humidity, which had me dripping with sweat. The struggle continued throughout the long out-and-back on St. Charles, though I was still able to keep my pace between 7:25 and 7:31 for miles 2 through 8. One cool thing about this stretch was getting to see all of the elite runners coming back on St. Charles. This group included Mo Farah, Mesi Defar, Salane Flanagan, and Kara Goucher. It is amazing to me how they can look so incredibly smooth while running that fast. Impressive! Anyway, sometime during mile 8, I struck up a conversation with another runner named Chris, who was from Lafayette, Louisiana. We were running at a similar pace, and he asked if we could run together for a while. It was at this point that we turned off of St. Charles and headed toward the French Quarter. I think the conversation served to reset my brain, my body finally started to relax, and I fell into a really good rhythm. Running through the Quarter with Chris, I rattled off splits of 7:20, 7:14, and 7:16. During mile 12 on Esplanade, on the way out to City Park, I started pulling away from Chris with splits of 7:13 and 7:09 to finish out the first half at a time just over 1:37. This left me only 2-minutes off of BQ pace, and I was feeling awesome. However, I knew the temperatures were rising, so I started dumping water over my head beginning with the aid station just before the midway point to try and control my heart rate. As the course started up Marconi Dr. toward Lakeshore Dr. and Lake Pontchartrain, I kept the foot on the accelerator with splits of 7:09 and 7:13 for miles 14 and 15. At this point my mind started to believe that I could increase the pace and push for a BQ. However, this thought quickly evaporated during miles 16 and 17 as the course left the shade of Marconi Dr. and came into the full sun and high winds on Lakeshore Dr. for the long out-and-back by Lake Pontchartrain. It was at this point that I wilted in the warm conditions, and the wheels started to come off. I knew I would have to slow my pace if I was going to finish the race. To that end my splits got progressively longer with each mile as the pace krept up into the 7:20s, 7:30s, 7:40s, and slower. I’m thankful that the wheels never completely came off the bus, but I went from feeling on top of the world to hanging on for dear life. I wanted to stop and walk with every ounce of my being, but somehow I was able to just keep running. Chris caught back up with me during mile 22, which was just after my first split over 8:00 for mile 21. He was very encouraging to me, and this helped me to a 7:50 split before turning back onto Marconi Dr. for the return trip to City Park. During mile 23, Chris started pulling away from me, and my pace again slowed with splits of 8:19 and 8:28 for miles 23 and 24. At the start of mile 25 I gathered up every ounce of energy I had left, and was determined to finish as strong as I could. As we turned into City Park, I reeled off my final two miles with splits of 7:52 and 7:49, before sprinting the final 385 yards to the finish with my hands held high in celebration. I finished with a time of 3:18:28, which ended up being my second best finish in a marathon. Even though this was a long way from a BQ time, I’m thrilled with the result in tough conditions. I now have confidence that given better weather conditions I could take a legitimate shot at running a 3:10 marathon. I’m also happy to complete my first marathon after the stress fracture with my leg still feeling great. 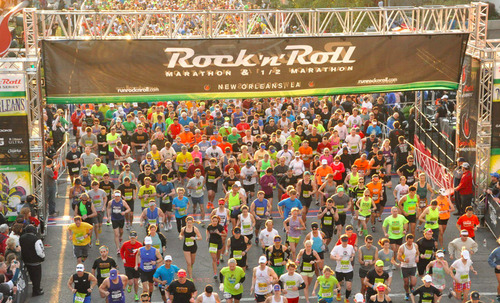 Olivia: The Rock ‘n Roll NOLA Half Marathon was Olivia’s 12th half marathon, and she CRUSHED IT with a 2:31:53 finish and new PR by over 5-minutes! This comes on the heels of her over 4-minute PR at the Chickamauga Battlefield Half Marathon back in November. It was awesome to be able to spend a great weekend, in a great city, with my beautiful bride, and for both of us to be able to participate in the race. 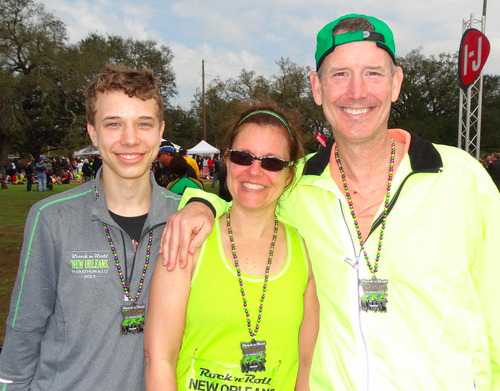 The Dedmans: It was wonderful to share the race with the Dedman family. Janna was incredibly supportive of Olivia, pacing her to the new PR. Marc turned in his normal solid performance, with a 1:34 finish in the half, even though his training had been very limited due to a crazy work schedule. 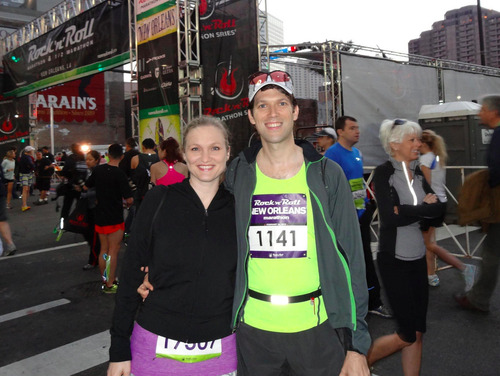 Robert SMASHED his first half marathon, in tough conditions, with a finish time of 1:29:53. Fantastic! Emma was also out there on the course cheering all of us on. Besides the race, it was fun to hang out with them all weekend, as they allowed us to follow them around like lost puppies! However, even with all of this, I would have to give them a solid “A” for the NOLA event. The first half of the course is extremely well designed and interesting, and surprisingly the second half is pretty good. All full and half marathon participants received a gender-specific Brooks technical t-shirt (very high quality). 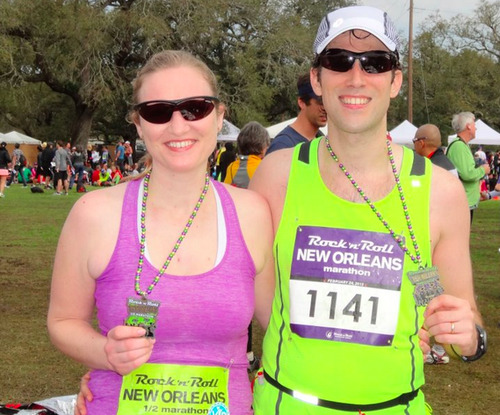 The finisher’s medal is great (like all Rock n’ Roll events) and incorporated Mardi Gras beads. There were 17 aid stations and most had both water and Gatorade. I was surprised that the water and Gatorade were not always in different cups. The mile markers were elevated, making them easy to see, and all included split times. Overall the NOLA course is pancake flat. Very similar to the Chicago Marathon or the Indianapolis Mini Marathon as it relates to elevation changes. The only hills of any significance are the short bridges on Lakeshore Dr. by Lake Pontchartrain. 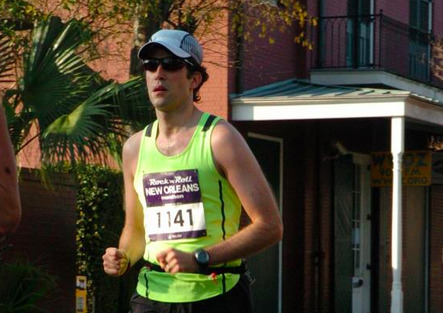 The first half of the course was a great tour of New Orleans and included; A long out-and-back stretch on St. Charles Ave which was beautiful, a pass through the French Quarter on Decatur St. which went by Saint Louis Cathedral, and a finish up Esplanade Ave toward City Park. The second half was also pretty good. After a long, tree-lined stretch up Marconi Dr, the course turned onto Lakeshore by Lake Pontchartrain. I really enjoyed running by the lake. The water was beautiful, and I enjoy out an back sections on race courses. The finish back down Marconi was slightly downhill before a final slight uphill in City Park. City Park made for a excellant finish area with plenty of room to move around.